The month of October is supposed to be about the gore of Halloween, but not to the Diversity, Inclusion and Accessibility department at Arizona Western College. 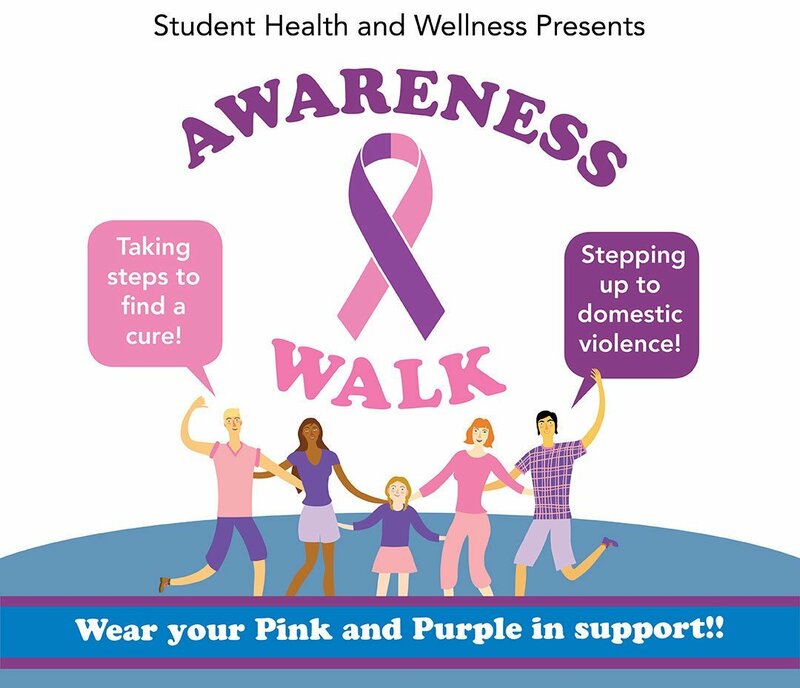 On Oct. 17, the department held a walk, starting in front of the 3C building, to spread awareness on finding a cure for breast cancer and stepping up against domestic violence. Breast cancer is the most common cancer, affecting 1 in 8 women in the U.S. More than 2 million injuries and 1,300 deaths are caused by domestic violence. Along the path that was laid out by pink and purple cones were signs that provided information on the two key issues. The signs provided not only facts but also encouragement. For example, the purple signs informed victims of domestic violence that they aren’t alone in their fight. They even provide the signs to look out for when breast cancer starts to develop. One participant, Samantha Rivas, a second-year college student took the time to do the walk. Samantha herself has never had any type of cancer, but her aunt does, and Samantha came to support her. “Events like these do spread awareness because, if they don’t know anyone with breast cancer, it still brings their attention to the issue and gives them an opportunity to contribute help to others who have been affected by it,” Rivas said. Event organizer Christine Rouff said she wanted to have the walk on campus because it’s a good platform for reaching students, staff and community members about the issues. This is the first walk that Rouff has organized the event, and she felt it was a good start. She said having the cones and statistic signs out on campus gets the topic out there. She likes letting students know that the resources and guidance of her department is available for them any time they need it. The campus has done cancer walks in the past, but this was the first year it was combined with domestic violence for a single event. In the hope of attracting as many students as possible, the walk was open from 10 a.m. to 1 p.m. so that participants could start whenever they wanted. In order to reach everyone, reminders went out on the radio, in newspapers and on social media. “I don’t regret doing the walk because students learned something, and there was a great turnout,” Rouff said. One reason Rouff is involved with this program and in the event is that her sister was diagnosed with breast cancer when she was 33, and luckily is doing well. This issue is important to her in being able to see from her sister’s perspective and how scary and difficult that situation can be and how important it is to raise awareness of the sufferers’ struggles. Rouff also hopes to set up a support system for victims of domestic abuse, who might be afraid to tell their stories, that people are here for them. Rouff’s departments has events scheduled for every month from August to May on topics such as health and wellness as well as suicide awareness and prevention. Next year, for breast cancer and domestic violence month they plan to hold a fair with even more informational booths. For information about any of the upcoming events, contact Christine Rouff at Christine.rouff@azwestern.edu or call (928) 317-6067.